The hikers were not breathing and their hearts had stopped, reports said. Final confirmation of death in Japan always comes via a medical examination. About 250 people were trapped on the slopes of the popular beauty spot, but most have got down safely. 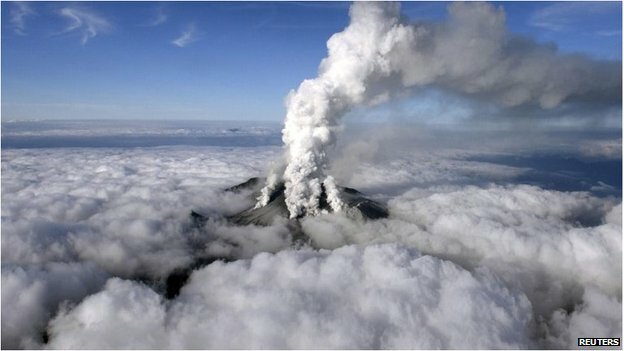 The volcano, about 200km (125 miles) west of Tokyo, erupted without warning on Saturday, spewing ash and rocks. The eruption forced many of those on the mountain to make emergency descents through clouds of volcanic ash and falling rocks. Almost 50 people were thought to have stayed on the mountain overnight, reports said. As the search effort intensified earlier on Sunday, officials said they were searching for 30 people feared missing or buried by ash. Confirmation soon came that a similar number of people had been found unresponsive on the mountain. 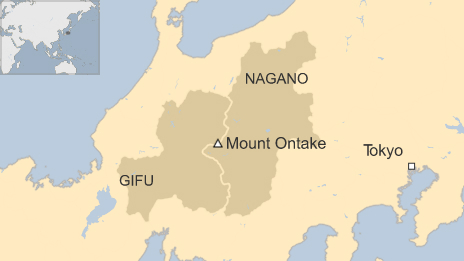 “We have confirmed that more than 30 individuals in cardiac arrest have been found near the summit,” a Nagano police spokesman told the AFP news agency. Military helicopters plucked seven people off the mountainside earlier on Sunday, according to reports, and workers on foot were also helping others make their way down. Japan is one of the world’s most seismically active nations but there have been no fatalities from volcanic eruptions since 1991, when 43 people died at Mount Unzen in the south-west. The BBC’s Rupert Wingfield-Hayes, in Tokyo, says it’s not clear why there was no warning of Saturday’s eruption. Japan monitors its volcanoes closely and any that show signs of activity are immediately closed to hikers – but this time that did not happen. 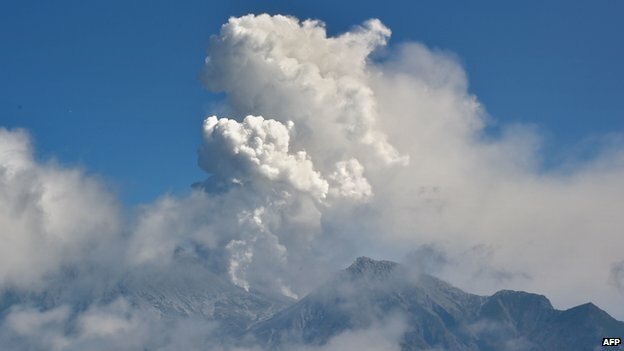 The sudden eruption on Saturday was described as “like thunder” by one woman who runs a lodge near the summit. 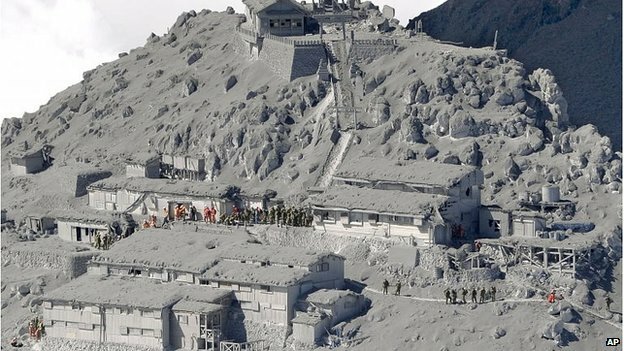 Heavy, toxic volcanic ash up to 20cm (8in) thick covered much of the mountain, reports said. “All of a sudden ash piled up so quickly that we couldn’t even open the door,” Shuichi Mukai, who worked in a mountain lodge just below the peak, told Reuters. 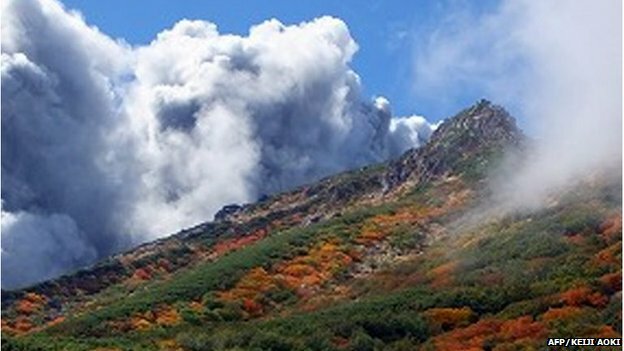 Ordinarily Mount Ontake is a popular place to see autumn foliage. Its peak is 3,067m (10,120ft) high and the mountain is a popular hiking route, dotted with lodges, cabins and well-marked trails. The knives are out and accusations of racism are being bandied around again. Only this time it’s not a silly corporate ad with fake noses that’s to blame. The culprit this time is Japan’s Ministry of Foreign Affairs, which has sent an 11-page leaflet to Japanese embassies and consulates. The education literature has been published in response to Japan finally ratifying the Hague Convention on the Civil Aspects of International Child Abduction, reports the South China Morning Post. This has been a matter of contention in Japan, which has been seen as soft on issues of child abduction — mostly notably Japanese partners taking their child to Japan and away from the other parent who is foreign, who until now could not do anything about it. Signing the Convention, going into effect from this past April in Japan, means that children taken by one parent are legally required to be returned to the country of their regular residence. In other words, a Japanese parent cannot suddenly take their child out of a foreign country where they had been living full-time. 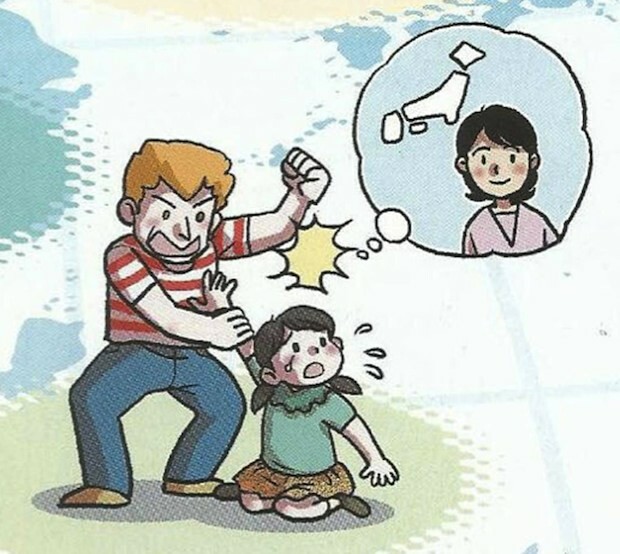 The pamphlet uses manga-esque images (taking its subject seriously, then) and, more offensively to some, depicts a white man apparently assaulting or abusing a Japanese-looking child as she dreams of her mother far away in Japan. 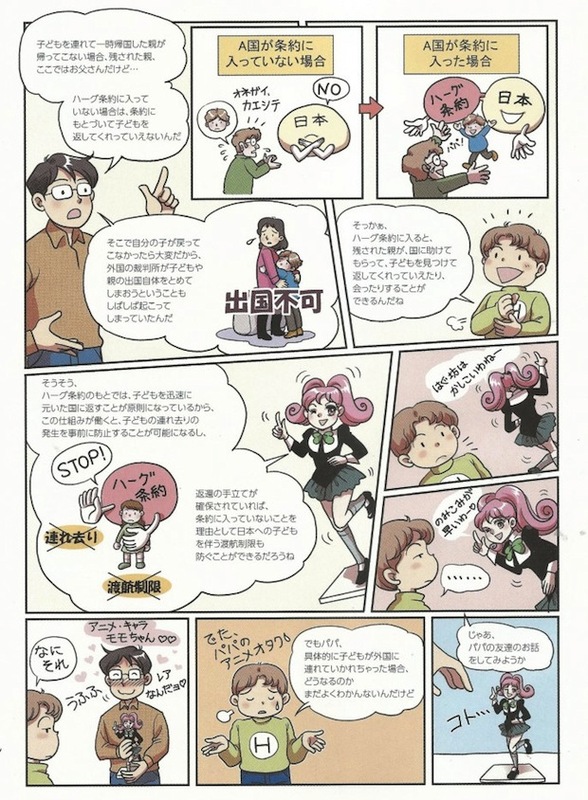 While it is common for even official documents in Japan to use manga imagery, the one-sided portrayal of the issue has angered people like Debito Arudou, a naturalized Japanese citizen originally from America. It particularly makes some indignant because the issue of child abduction that got many activists campaigning for Japan to ratify the Convention was most infamously due to cases of Japanese (usually women) taking their half-Japanese child away from foreign partners (usually men). And government rubber-stamped “Cool Japan” rears its silly head too, with an anime figure bringing some cute moe to the proceedings and at one point acting as a kind of interlocutor between child and father, who is an otaku. Perhaps ultimately, more than actual discrimination, the truly offensive thing here is that the bureaucrats took a very serious issue and belittled it with a visual style that made it all seem silly. 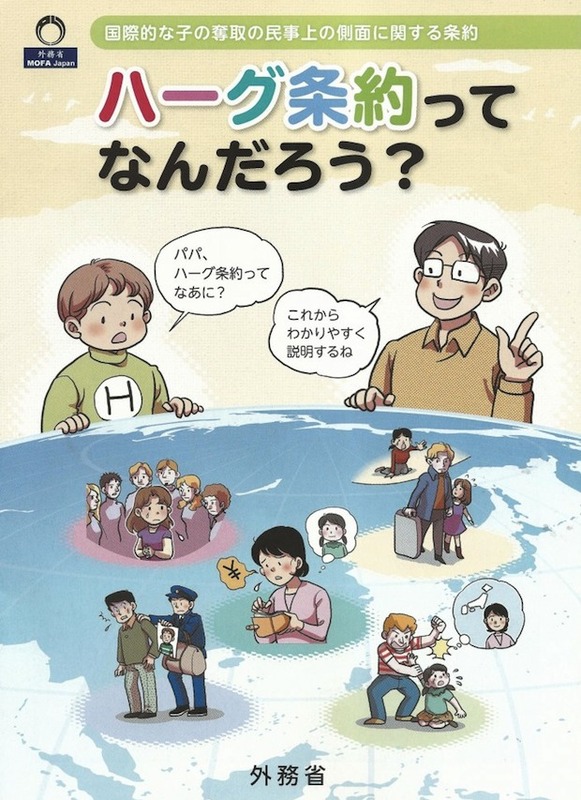 The film “From the Shadows”, about international child abduction in Japan, is to be screened at the Unspoken Human Rights Film Festival in Utica NY, USA, at 6pm on Saturday 4 October 2014. This follows earlier screenings at the Philadelphia Film Festival (October 2012) and in Vancouver (November 2013). There is an existing link to the film’s homepage on this blog’s blogroll to the right, although at the time of writing, it has yet to be updated with details of the latest screening. Go along if you can as the film comes highly recommended. I hope that the next screening takes place somewhere in Europe so that I and others caught up in these matters this side of the Atlantic can get to view it as well. UK Prime Minister David Cameron said he was delighted the UK would remain together and said the commitments on extra powers would be honoured. He announced that Lord Smith of Kelvin, who led Glasgow’s staging of the Commonwealth Games, would oversee the process to take forward the commitments, with new powers over tax, spending and welfare to be agreed by November, and draft legislation published by January. The prime minister also acknowledged that the people of England, Wales and Northern Ireland must have a bigger say over their affairs. And he promised a resolution to the West Lothian question – the fact that Scottish MPs can vote on English issues at Westminster. The pound hit a two-year high against the euro and a two-week high against the US dollar, as Scotland voted against independence. Royal Bank of Scotland said it would keep its headquarters in Scotland following the “No” vote. Scotland rejected independence by 55% to 45%. For latest results and full coverage, go to bbc.co.uk/scotland-decides. He said the referendum and the high turnout had been a “triumph for the democratic process” and promised to keep his pledge in the Edinburgh Agreement which paved the way for the referendum to respect the result and work for the benefit of Scotland and the United Kingdom. In a rallying call to his supporters, Mr Salmond urged the Yes voters to reflect on how far they had come. Speaking in Downing Street, Mr Cameron said the result was decisive. He said: “Now the debate has been settled for a generation, or as Alex Salmond has said: ‘Perhaps for a lifetime’. The prime minister also spoke of the implications for the other nations of the UK. ‘English voices’“In Wales there are proposals to give the Welsh Government and Assembly more powers and I want Wales to be at the heart of the debate on how to make the United Kingdom work for all our nations,” he said. Mr Cameron said “millions of voices of England must also be heard”. “The question of English votes for English laws, the so-called West Lothian question, requires a decisive answer so just as Scotland will vote separately in the Scottish Parliament on their issues on tax, spending and welfare, so too England as well as Wales and Northern Ireland should be able to vote on these issues. What started as a vote on whether Scotland would leave the UK has ended with an extraordinary constitutional revolution announced outside Downing Street by the Prime Minister. It throws down the gauntlet to the Labour Party that we are going to see very big change coming and it had better come quickly. We always used to be told that if you laid all the economists in the world end to end they still wouldn’t reach a conclusion and I think that could be said often about parliamentary committees and inquiries and commissions. Well, it can’t happen this time because it’s not taking place in a sealed room with the Westminster parties, the old smug consensus, getting round an argument with each other as before. This is really taking place in a huge glass house, being watched by all the Scottish voters and by millions of people around the UK. What the Scottish shock has done is produce a constitutional revolution on a very, very tight timetable. Possibly the most exciting political story in my lifetime. Alistair Darling, who led the Better Together campaign, said the people of Scotland had “chosen unity over division and positive change rather than needless separation”. “It is a momentous result for Scotland and also for the United Kingdom as a whole,” he said. “As we celebrate, let us also listen,” he said. “More than 85% of the Scottish population has voted. People who were disengaged from politics have turned out in large numbers. “While they have voted on the constitution, that was not the only or perhaps the major issue that drove them to the polls. Mr Darling thanked his “great team of volunteers” who had worked on the Better Together campaign. Mr Salmond’s deputy, Nicola Sturgeon, said in an earlier concession statement that there was a “real sense of disappointment that we have fallen narrowly short of securing a ‘Yes’ vote”. But she said the country had been “changed forever” and vowed to work with “anyone in any way” to secure more powers for Scotland. The vote was the culmination of a two-year campaign. Talks will now begin on devolving more powers to Scotland. Glasgow, Scotland’s largest council area and the third largest city in Britain, voted in favour of independence by 194,779 to 169,347, with Dundee, West Dunbartonshire and North Lanarkshire also voting “Yes”. But Edinburgh, the nation’s capital, rejected independence by 194,638 to 123,927, while Aberdeen City voted “No” by a margin of more than 20,000 votes. Exactly 4 weeks have now passed since the landslide in my son’s city and almost 3 weeks have passed since I received the news that he is safe notwithstanding events there. I said that it would post about this issue again. News of the landslide has now faded not only from the headlines in Japan but also from the news generally. According to the Wall Street Journal blogs site on 3 September 2014, the number of dead now stands at 72 with 2 people still missing; I have not been able to find anything more recent than this. At least the death toll will be somewhat less than the earlier ‘missing’ figures suggested. Local evacuation ‘advisories’ are reported as having been lifted. This article from 2 September 2014 contains a series of close-up photographs which show some of the devastation in local neighbourhoods at close quarters. Given the severity of what happened and the fact that lessons were not learned from the previous (and less deadly) Hiroshima landslide in 1999, one has to hope that the issue has not also slipped from the consciousness of decision makers in Hiroshima and elsewhere in Japan, given that Hiroshima-ken is particularly prone to this sort of incident. Since I last posted on the issue, the only other significant coverage as regards the need for better readiness – and more common-sense positioning of residential properties – was this letter on 3 September 2014 in The Japan Times. Change can be slow in Japan but this is one of those issues where that is not a good thing.